Jennifer's latest creation, Jenniverse.com! The home of all her creations! Jennifer Diane Reitz was born December 30th, 1959. She stands 5’ 11’’ tall, and weighs 210 pounds on average. She has green eyes with golden centers near the pupil. Her hair is dishwater blond, her skin pale and almost translucent in places. She wears glasses, and identifies as bisexual, leaning toward lesbian. Jennifer has been active in the games industry since 1981. Originally involved with dice-based fantasy role-playing gaming, she transferred her artistic and game design skills to the computer environment in 1985, with her sale of a game design to Activision, in cooperation with her high school friend, Stephen Lepisto. 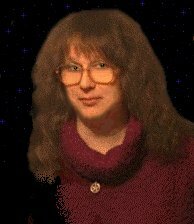 She produced the original Amiga and IBM ‘Shanghai’ tile sets, as well as doing work on numerous other projects for Activision, such as ‘Aliens’, ‘Transformers’, ‘Gamemaker Science Fiction Library’, and others. She was a design consultant for Electronic Arts ‘Legacy of the Ancients’, and re-designed ‘Pharoah’s Revenge’ for SRI. Jennifer then went on to work for many other game companies, such as Epyx, Sculptured Software, Interplay, and others, in various roles. She was a co-founder, game authority, and visual designer of the popular web sites HappyPuppy.com and Linktown.com, and helped in the creation of Otakuworld.com. Her gaming reviews have been enjoyed by hundreds of thousands of gamers. In fact, you can check some of them out right now in Jennifer's Unbiased and Unashamed Game Critiques. Jennifer is an avid fan and collector of anime and manga, and is proud to call herself Otaku. She also loves science fiction, fantasy, and the collection of anime and games based toys and dolls, as well as anime and games. Her collection of games is legendary, sporting over 3700 titles, as well as every successful game machine ever released in North America, essentially turning her home into a software museum. She believes that to make great games, one must play all games. Jennifer believes that computer games and software are the true artform of the centuries to come and the future of most media in the world today. With Stephen Lepisto she formed ‘Accursed Toys’ her family owned company. Together, she and Stephen created the game ‘Boppin’ for both the Amiga and the IBM PC, as well as ‘Laboratory of Life’, a playable and scorable version of the A-Life simulation ‘Life’, and ‘Twirliquin’s Peek-A-Boo’, the first ever Peek-A-Boo simulator! Accursed Toys has also done numerous other free goodies, including the popular ‘Dr. Who’ game for the Amiga. Jennifer lives as part of a four-person Polyamory, or group marriage, with her three spouses Sandra Woodruff (primary founder of HappyPuppy.com and LinkTown.com), Eldenath DeVilya (expert on medieval studies and costuming), and Stephen Lepisto (master programmer). Together they are a family, first formed in 1982-1984. She finds the Polyamory an absolutely idyllic lifestyle. Jennifer’s hobbies include games of all kinds, especially of the electronic sort, anime and manga, sumo, collecting toys and dolls, cartooning, science fiction and fantasy, Kaiju and martial arts movies, artificial life studies, comedy, and anything else that seizes her fevered imagination. Mentionable bizarre traits and facts about Jennifer include a penchant for dressing in colorful jumpsuits, always wearing socks of opposite colors from each other, drawing cartoons on restaurant napkins and placemats, making sculptures out of her uneaten food if she has to wait too long, and praying to the moon. Her online and game ‘handles’ are "Lupa Lycanthia" and "Mahu Nadle Winkte". Her nickname is "Jenniko-Chan"... though she spells it in Katakana as ‘Giniko’. She refused to join MENSA on the grounds that "they are too snotty". Jennifer suffers from panic disorder, but the condition is successfully under treatment. Jennifer spent her entire childhood moving every three to six months, and so essentially lived inside the world of books, resulting in some curious, and often overly proper, social behavior! She had lived in seven different states by the age of seven. When she was 13 and living near Blackfoot Idaho, while sleeping in a backyard, she saw an unidentified flying object: a perfectly silent, dull gray, rounded triangle, with a dome like bulge on the bottom. It was the size of her thumbnail on her outstretched hand. She observed the object with a friend for about two minutes, as it moved in an impossible ‘L’ shaped path across the sky. It changed direction instantly, with no curving or change in speed. It had no lights, markings, windows, or seams, being one single formed shape. She offers no explanation whatsoever for the object, just that she, and her friend, saw it exactly as described. Jennifer lives her life as an ‘eternal child’ and believes that real maturity comes from being perfectly child-like, as opposed to child-ish. Her favorite color is Heliotrope, her favorite cuisine is Japanese, and she tends to be very shy in public, although she enjoys the attention of others. Jennifer values the ideals of friendship, of loyalty, honor, commitment, and compassion above all else. This is probably the closest thing she has to a religion, in the conventional sense. "Life is a game dear, play it well. You create your own heaven, you dig your own hell." "Those with an issue, have that issue themselves." "The true artist sculpts their own life in the medium of space-time. Therefore the life of the true artist must be re-made in their own image." "The open mind must be able to completely replace even the most sacred of beliefs, when new information invalidates them." "Games are the greatest expression of the abstract functions of consciousness. Consider the lowly game of chess: nothing more than a set of shaped objects scattered upon a painted slab. Yet the arbitrary agreement of two intellects enchants these physical objects with abilities, value, rules of behavior, and ultimate purpose. This is to me the most powerful and amazing capacity of the mind." "Your very best friend, is in fact, your true love." "Always do the dishes immediately after you eat. Families can dissolve over a loaded sink." "Always marry your best friends...regardless." Jennifer's otaku work and play space. This is the official home for all of Jennifer's creations, past, present, and future. See the amazing Jenniverse! Jennifer has created an on-line Manga comic strip with a truly unique set of characters. Printed versions of this wonderful manga-style comic strip are now available. See Unicorn Jelly! (dated: 5/23/1998) Jennifer Reitz was there for the premiere showing of Disney's version of "Kiki's Delivery Service" and wrote a review of the movie. Find out what's good and bad about this version of a wonderful Miyazaki film! Jennifer wrote a number of game critiques back in 1996 and they are once again available here on Otaku World. Check out Jennifer's Unbiased and Unashamed Game Critiques! Please send comments to Jennifer Reitz.